Need a great vegetarian chili recipe? 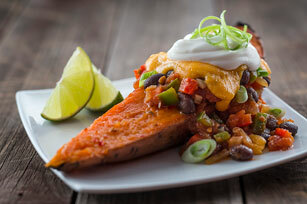 Our recipe for Veggie-Chili Sweet Potato Wedges is a must try. Vegetarians and carnivores alike will eat this one up! Pierce potato wedges several times with fork. Microwave on HIGH 4 min. or until slightly softened. Place potatoes in large bowl. Add 2 Tbsp. dressing; toss to evenly coat. Place on parchment-covered baking sheet. Bake 30 min. or until tender and lightly browned around edges. Meanwhile, heat remaining dressing in large skillet on medium heat. Add yellow onions and garlic; cook 5 min. or until crisp-tender, stirring occasionally. Stir in peppers and chili powder; cook and stir 1 min. Add beans and tomatoes; stir. Bring to boil; simmer on medium-low heat 20 min., stirring occasionally. Serve potatoes topped with chili mixture, cheese, green onions and sour cream. Garnish with 2 Tbsp. each chopped fresh cilantro and jalapeño peppers. Serve with lime wedges on the side. Serve with a green salad tossed with Kraft Zesty Italian Lime Dressing.